SINGAPORE - A two-year-old boy, who survived an 11-storey fall from a Sengkang Housing Board block on Sunday (Nov 25) morning, was possibly saved by his diapers. The diapers reportedly caught on the clothes rack of a fourth-floor unit, breaking his fall. 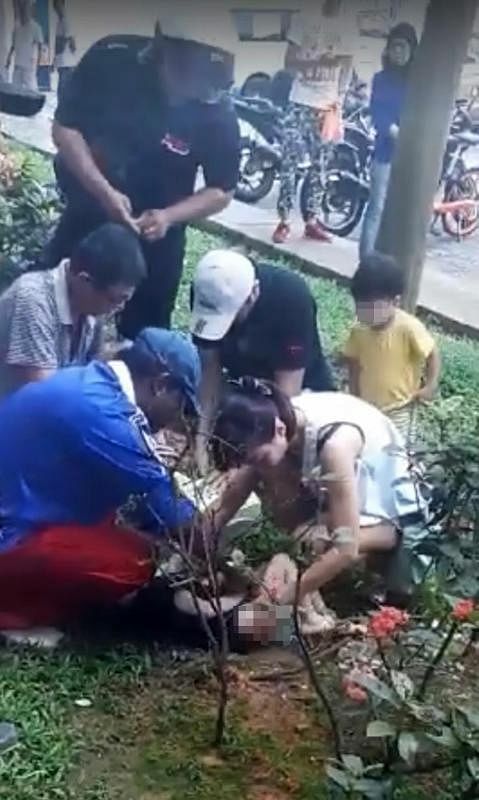 The boy, who was found by residents lying on a grass patch at the foot of Block 182A Rivervale Crescent at around 10am, was rushed to KK Women's and Children's Hospital (KKH) where he was reported to be in stable condition on Sunday night. When contacted for update on the boy on Monday, KKH said it does not have permission to share any information on the patient. The Straits Times understands that the toddler was standing on a stool and fell from the window of a 11th storey flat, sustaining severe injuries. A man believed to be the boy's father declined to comment when approached outside their family home on Monday afternoon. Neighbours and a doctor who rushed to the scene said the toddler is lucky to be alive. Dr Lenny Wan, a general practitioner at Rivervale Crescent Medical Centre at the same block, said he was on duty on Sunday morning when a resident rushed into the clinic asking for help. Dr Wan told The Straits Times that the boy was conscious and crying when he arrived, with injuries mainly to the left side of the body. "There was a gaping wound on his left arm, the bone was probably fractured in more than one place and the area around his left eye was also bleeding." After assessing the injuries, Dr Wan, 42, helped paramedics to keep the boy's neck stable when they arrived about five minutes later. "I'm surprised the injuries weren't worse... children generally have more padding and can survive falls better than adults," said Dr Wan, who added that the boy's diapers were torn. Shin Min Daily News quoted an eyewitness as saying that the boy's diapers had caught on a fourth-floor unit's clothes rack, cushioning his fall. The boy's mother told Shin Min that the incident had happened as the window had not been closed. Neighbours described the couple, who are in their 20s, as friendly but reserved. Clinic supervisor Velayuthan Agamuthu, who lives on the four floor and often greets the family at the void deck, said he was having breakfast at a nearby coffee shop on Sunday morning when he heard that someone had fallen from the block. "When I saw the boy I was shocked. He was crying and you could see the bone of his arm," said Mr Velayuthan, 53. "The parents came down after the ambulance left. They didn't know what had happened. I asked the father why he didn't put the (window) grill. He said they have one but they forgot to close the kitchen window," he said. "I saw the father again today, who said the boy is still in ICU (intensive care unit) but okay. I'm glad he's still fighting for life - he's a very lucky boy." A neighbour, who lives two units away from the family, said the couple and their son moved in about a year ago, and were quiet neighbours. "They're a good family, the boy sometimes comes to my gate and plays," said Mr David James, 40. "They are being judged very harshly online, but I'm sure the parents are already suffering," said Mr James, who is unemployed.